Back in 2014, Surrey NanoSystems introduced a material called Vantablack, that until now was the the darkest, most blackest material ever invented. The company claimed the material was capable of absorbing 99.96 percent of light, but apparently this was not dark enough. 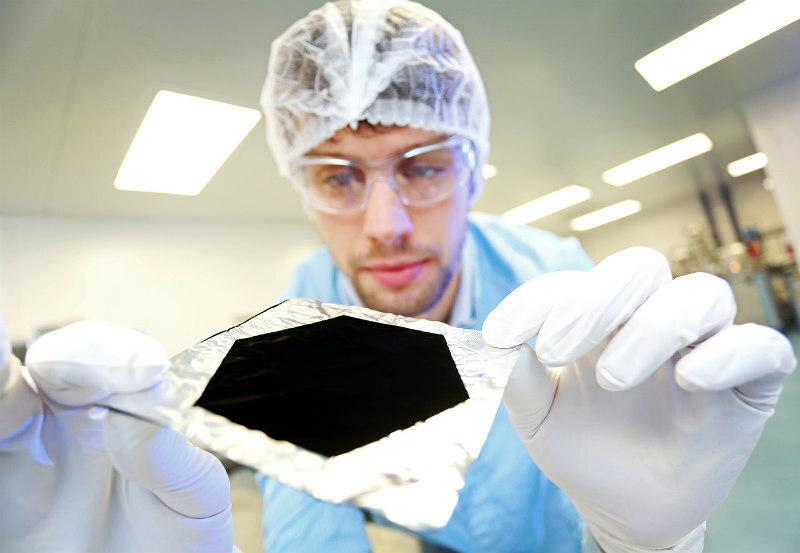 This week Surrey NanoSystems announced that they’ve made Vantablack even darker, so dark in fact that spectrometers can’t even measure it. Carbon nanotubes are hollow structures with one or more walls formed from atom-thick sheets of carbon. Each tube is around one fiftieth of one millionth of a meter in diameter, making it an ideal and appropriately sized building block for engineering structures that exhibit low-reflectivity and high-emissivity across a wide-range of frequencies. The height of a Vantablack coating is typically around 20 to 30 microns and the high proportion of free-space within Vantablack (>99%) makes it extremely light. One square meter of coating weighs only around 2.5g. The carbon nanotubes have an exceptionally high modulus of elasticity and will therefore flex and bend, making them very robust in environments subject to extreme shock and vibration. The strength of the nanotubes bond to the substrate is high, making it difficult to remove the material through thermal cycling, shock or vibration. It is however sensitive to mechanical abrasion. The structures are incredibly tolerant to thermal cycling as a result of the intrinsic properties of the carbon nanotube building blocks, and their ability to adhere to a substrate. The characteristics of Vantablack are of course highly desirable in space applications, where components are subjected to extremes of thermal-cycling, mechanical shock, vibration and exposure to high-vacuum. There are however additional possible application the material can be used for as: solar energy, spectroscopy, cinematography (projectors, visual FX), architecture and more. The name Vantablack® stands for Vertically Aligned Nanotube Array black.